The biggest of those risks is leverage — or piling on debt to boost profits — and banks have a lot less of it than they used to. 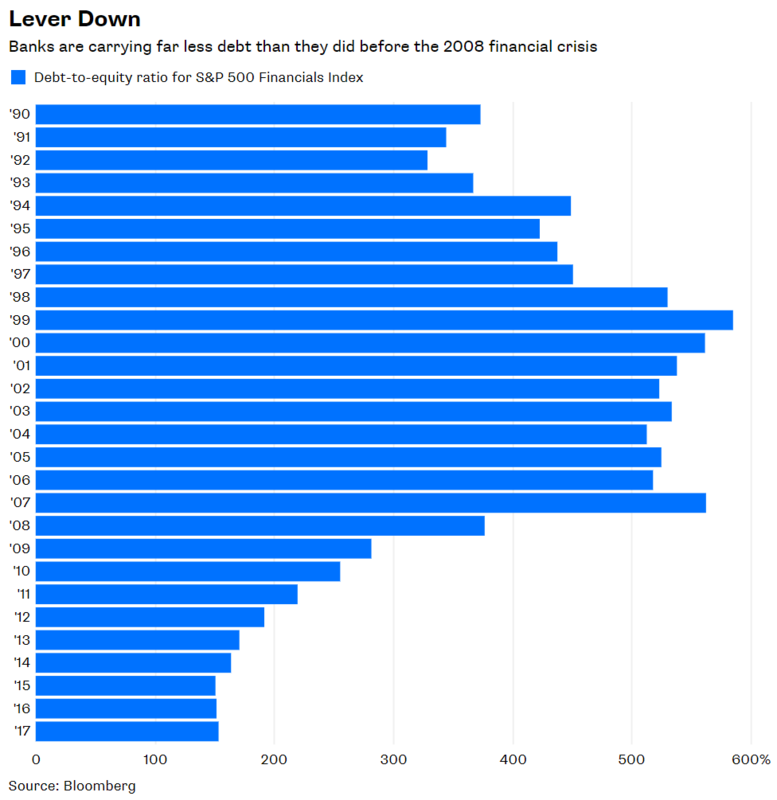 The debt-to-equity ratio of the financials index has dropped to 159 percent as of the first quarter from 563 percent at the end of 2007. The debt-to-assets ratio has fallen to 19 percent from 43 percent over the same period. None of this is lost on the market, which has tagged financial firms with prices befitting the boring businesses they’ve become. The sector is one of the cheapest, with a price-to-earnings ratio for the financials index of 15.7 based on 12-month trailing earnings per share. 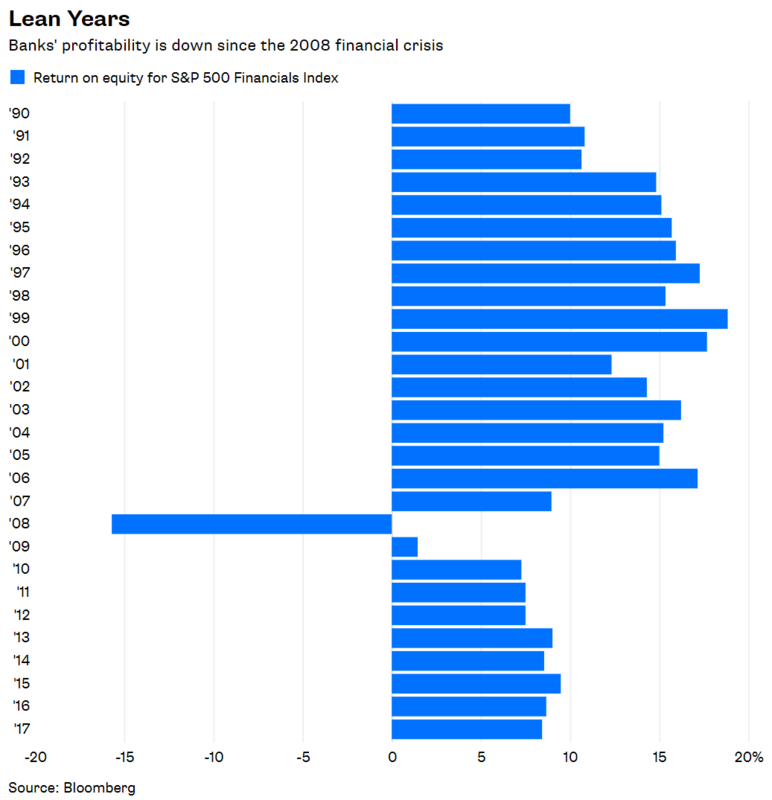 That compares with a P/E ratio of 20.7 for the S&P 500 Index and 22.6 for the high-flying S&P 500 Information Technology Index, a premium of 44 percent over banks. Still, investors don’t seem comforted. The financials index was down 13 consecutive trading days through Wednesday, with the biggest declines coming after the first Fed announcement on June 21. Many observers blame those declines on worries that an inverted yield curve and a trade war will dent banks’ profits. Sure, those are legitimate concerns, but they don’t explain why banks and why now. An inverted yield curve is no worse for banks than the environment of low interest rates and strict regulation that has existed since the financial crisis. And the financial sector would be among the least affected by a trade war. 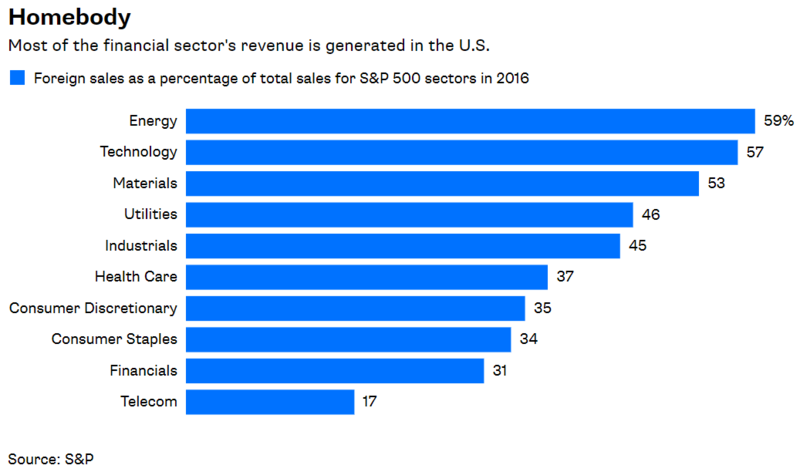 Roughly 31 percent of the financial sector’s revenue was generated outside the U.S. in 2016, according to the latest numbers compiled by S&P, the second-lowest percentage among sectors. By comparison, 57 percent of the technology sector’s sales came from overseas, and investors don’t seem nearly as worried about tech firms. The better explanation is that talk of stress test is colliding with investors’ actual stress about yield curves and trade wars and conjuring memories of the financial crisis. But if the numbers don’t persuade investors that the next crisis won’t look like the last one, then maybe a look at previous bear markets would. In reverse chronological order: The bursting of the dot-com bubble was behind the downturn from 2000 to 2002. A mass panic or newly introduced computerized trading, depending on whom you ask, set off the 1987 crash. Stagflation brought down the market from 1980 to 1982. A global oil embargo hit stocks from 1973 to 1974. I could keep going, but you get the idea. There is a common thread running through the scariest episodes: high stock prices. The average cyclically adjusted price-to-earnings, or CAPE, ratio for the S&P 500 has been 18 since 1928, according to numbers compiled by Yale professor Robert Shiller. 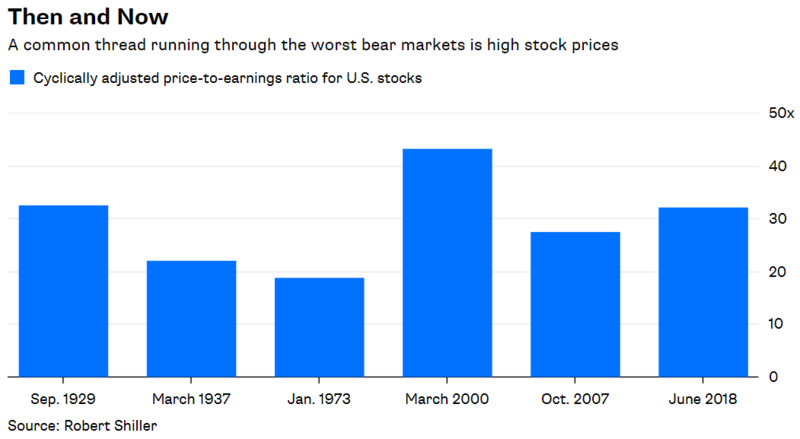 The five worst bear markets during those nine decades, as measured by peak to trough declines, commenced in 1929, 1937, 1973, 2000 and 2007. The average CAPE ratio on the eve of those downturns was 29 and the median was 27. The current CAPE ratio: 32. And it’s never just stocks. Other assets in the U.S. look frothy, too, such as private equity and real estate. In theory, asset prices should never get so rich. 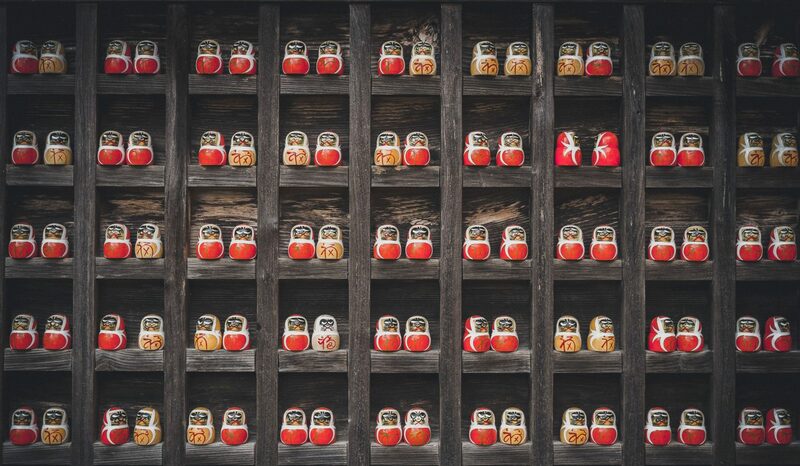 The traditional portfolio playbook calls for occasional rebalancing, which means selling assets that have done well and buying those that haven’t. But investors seem to have abandoned it. Investors should let all that sink in. They may have been powerless to prevent earlier downturns, but they could have limited the damage by refusing to chase assets to lofty levels. They should now think about how they might be contributing to the wreckage of the next crisis. Here’s a hint: It probably won’t involve the banks.